Qdoba is one of five new restaurant concepts opened in Lindenwood’s newly renovated. By converting a residential dining venue into a retail food court with five high-impact brands, Lindenwood University has grown its onsite foodservice sales by 8 percent in one year. A couple of years ago, Lindenwood University in St. Charles, Mo., had a problem similar to that faced by many other universities: how to keep students from going off campus to eat. The school had a residential dining facility and some retail but nothing like the kinds of commercial choices favored by today’s college students. So the school and its foodservice partner, Pedestal Foods, decided to do something about it. Pedestal conducted extensive research on campus and compiled feedback from the student body on brands they would like to see in a new retail dining venue. The research included regular meetings with the student-led food committee, conducting a robust survey on campus and gathering testimonials from students through the campus National Broadcast Society. Pedestal’s research tested a number of options, including food trucks, proprietary brands and up to a half a dozen national brands, which students were asked to rank in order of preference. The process took several months but yielded some critical information, including identifying the national brands students would most like to see from the choices offered: Chick-fil-A, Qdoba and Caribou Coffee. The new venue, the Spellmann Center Dining Hall, debuted in a renovated space that had previously hosted a dated all-you-care-to-eat residential dining facility—which was replaced with a newer one elsewhere on campus. The construction project itself only took a couple of months over the summer of 2016 making the venue ready in the fall. 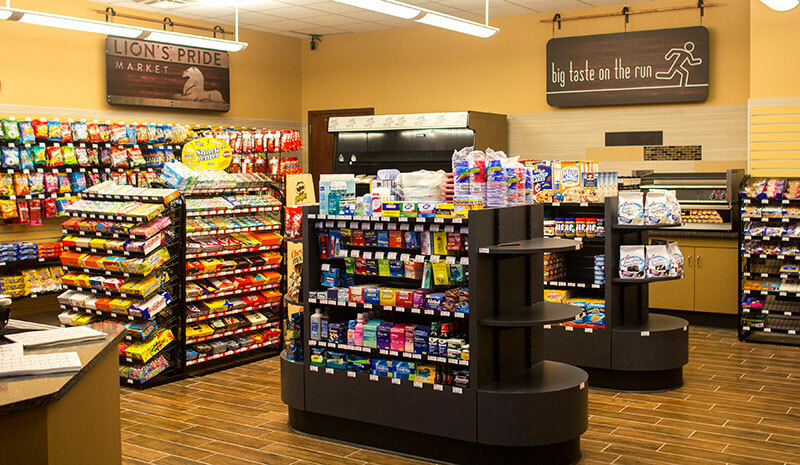 In addition to the three popular national brands—the first ones ever on campus—Pedestal also developed two custom concepts specifically for Lindenwood, The Grill Spot and SubHub, and also added a new c-store to the complex. “Our goal was to create strong proprietary brands that would marry well with the national brands at Spellmann, but that would also have a great impact on other facilities we work with as well,” Scherer says. If its first year is any indication, the change has been popular with students as the campus saw an overall increase of 8 percent in on-campus dining, mostly driven by retail sales. Also, while Lindenwood traditionally saw the majority of on-campus dining take place at its residential dining facilities, last year reversed the trend as about 60 percent of the traffic was at the retail sites, says Scherer. “While resident students are eating more at the retail places, we are certainly also seeing a good amount of increase from students living off campus,” he adds. The splashy new venue, of course, has made a big difference, and the university also adjusted its meal plan approach to provide more flexibility for resident students by adding a couple of block plans with dining dollars that can be used at all retail locations. Meanwhile, commuters got several new options that allow them to purchase different levels of dining dollars at a discount. Spellmann opens at 7 a.m. weekdays and goes until 7:30 p.m. Last year, all the stations were open for breakfast except Chick-fil-A, but that will change this fall when the unit adopts the chain’s breakfast platform. Also new this fall at Lindenwood will be a Starbucks outlet and a grab-and-go kiosk in the business school, which is on a side of campus away from the other foodservice outlets. Lindenwood is a private university with an enrollment of around 15,000, of which about 3,000 live on campus.